The RV business is booming in Elkhart County, Indiana. Understand the fire hazards found in RV manufacturing plants and how proper fire protection can protect plants from fire damage. In this case study, Pat Winn (project manager) details how we overcame major obstacles installing fire protection in an alcohol production facility. Our customer, American Airlines, had the wrap up of their design/build fire sprinkler project. The foam fire sprinkler test took place in November 2018, and was a success. See the video here. The Bloomington Fire Department received fire sprinkler training from our resident expert, Justin James. They wrote to us, letting us know how well-received the training was. F.E. Moran Fire Protection National has been training fire departments throughout central Illinois. Learn about the training they did for Springfield Fire Department. F.E. Moran Fire Protection National trained the Peoria Fire Department on how to work with fire sprinklers in buildings. A deadly Chicago fire exposes the flaws in Chicago fire code, Northern Illinois Fire Sprinkler Association reports. A manufacturing plant was saved when a single fire sprinkler head extinguished a fire. Learn how to keep your office safe from fire with this guide on fire prevention in the workplace. F.E. Moran Fire Protection’s Justin James completed a multi-day fire sprinkler training for the Springfield fire department. A fire at a university library took down the internet for two weeks for students. The Brooklyn Theater fire of 1876 is an example of the importance of fire safety training. The building more than met code for the era. The 200+ fatalities are the fault of management not training staff on evacuations, fire procedures, and chain of command. Shopping mall fire code violations resulted in the death of 64 people at a Russian mall. Mall fire protection is complex. Each store has its own fire hazards, and it takes a real pro to know how to protect it correctly (plus, keep that protection maintained). The stories below show case malls that not only adequately protected their property and maintained their fire sprinkler and alarm systems, but inadvertently tested the systems with real life fires. 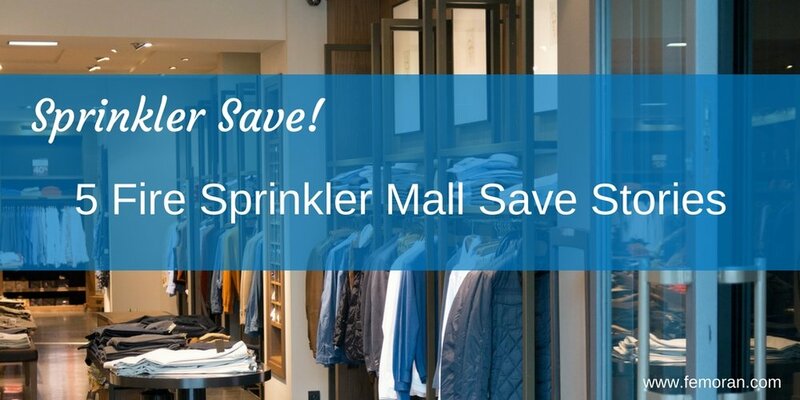 Installing fire sprinkler systems is only the first step to protecting malls. You need to inspect them and maintain them as well. F.E. Moran Fire Protection has a VIP program for malls. Malls get FREE inspections, and F.E. Moran Fire Protection does all the maintenance. 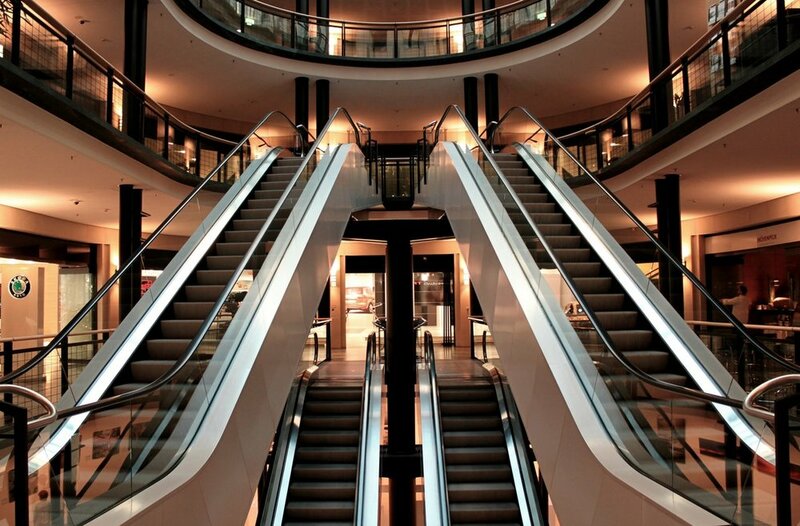 Simple solution to malls' fire protection needs. Fire crews found a fire in a restaurant storage closet at Eastridge Mall. Before firefighters arrived, a single fire sprinkler head in the building activated. This sprinkler controlled the fire until firefighters could arrive and extinguish it completely. In an official statement, the fire department said that the fire was contained to that small storage area and the damage was minimal. The exact cost of the damage has not yet been determined. In addition, no one was injured. "The presence of the system in this case limited spread of the fire to other areas of the structure. What could have been a well-developed and growing fire was controlled in the area of origin until arrival of firefighters. These systems represent an important life safety and property protection component of modern structures," said Casper Fire-EMS. A fire was reported at 9:17pm at an electronic store at Irving Mall. Heavy smoke was reported; however, when firefighters arrived, the mall's fire sprinkler had already activated. By 10:20pm, the fire was under control. The fire was contained in the room it originated. There was heavy smoke, but firefighters used fans to vent the smoke out of the building. A fire at Concord Mills started at 9:15am in the bathroom of an FYE store. Concord Fire Chief Ray Allen reported that the sprinkler system kicked on and helped put out the fire. The stores were able to re-open within two hours of the fire. Fairfax County fire investigators said that an exhaust fan started a 2-alarm fire at the Tysons Corner Center mall. When firefighters arrived, they reported smoke coming from the roof, and they were quickly able to put out the fire. The fire was started by an overheated exhaust fan motor that came in contact with paper towel rolls. The fire was in the storage closet of a kiosk. A fire sprinkler ignited and contained the fire until firefighters arrived to extinguish it. In total, there was about $30,000 in damages and no injuries. Fire crews responded to a fire in the kitchen of a restaurant at Mill Woods Mall. The fire was contained by an activated fire sprinkler until firefighters could extinguish it. Fire sprinklers are part of the 2018 tax reform. Learn how to write off 100% of your fire sprinkler installation costs. South Korea Hospital Fire - 37+ People Killed. A hospital in South Korea had a fire that killed 37 people.